Selenium gives you added protection against the top two causes of death in this country, heart disease and cancer, not to mention protecting the life of your thyroid, staving off diabetes and slowing the aging process. , a lack of selenium or any other minerals can be determined. 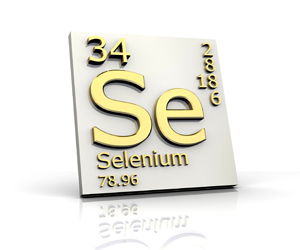 But why focus on selenium? Because this mineral plays a key role in preventing cancer and other chronic diseases. When there is enough selenium on board, it helps cancer cells destroy themselves. Selenium is also used by the body for thyroid hormone synthesis, and it is an insulin mimic, providing a much-needed turning point for people who cannot regulate their diabetes, hypoglycemia, metabolic syndrome, food cravings and weight gain. One new finding shows that selenium slows the amount of plaque buildup in the arteries. It works by revving up the glutathione so that the bad cholesterol, LDL, does not glue itself to the arterial walls. The LDL becomes a bad actor when it is oxidized by free radicals in the bloodstream. By revving up the glutathione peroxidase, selenium not only protects against cancer metastases, but also stops cholesterol from forming. Foods high in selenium are Brazil nuts, walnuts, wheat, rice, fish, turkey and oats. When taking a supplement, the recommended dosage is 400 mcg and should be prescription grade for professional use, because this type does not contain unwanted additives. Also, in higher concentrations, this mineral can be toxic to the brain, so more is not better. In the case of selenium, there is a fine line between the amount that is beneficial and the amount that is harmful. The SCIO biofeedback device can assess your need for this superstar among minerals using noninvasive techniques. Source: Rosenblat, M., Aviram, M., Macrophage glutathione content and glutathione peroxidase activity are inversely related to cell-mediated oxidation of LDL: in vitro and in vivo studies. Free Rad Biol. Med, 24;2:305-17, 1998. Brenda Haas-Krieger has a master’s degree in environmental health from the University of Cincinnati, College of Medicine. She also has a Doctorate of Divinity and has worked with Rife frequencies since 1999. 480-314-0065.